There is something new in science, despite claims that everything is known. New Zealand, like Australia (Australinea), is a continent - a very small one at that. The scientific powers that be have to verify that it is the seventh continent. 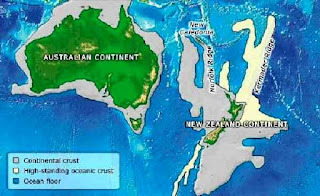 Professor Bruce Luyendyk named it Zealandia in 1995. Then, many claimed that it had only three of the necessary attributes. Satellite images show that the plate is unfragmented. With all four attributes identified, it is now accepted as a valid continent. The decision will be yes.